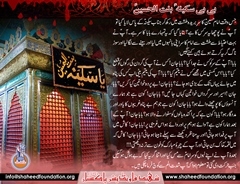 Bibi Sakina a.s was the youngest daughter of Imam Hussain. She was a vivacious child, full of love and happiness. Everyone loved Sakina. She was also a very religious girl. She enjoyed reading the Holy Quraan and never missed her prayers. From the age of two she took great care to make sure that her head and face were properly covered when in public. Sakina was Imam Husayn's most beloved child. Our Imam was often heard to say,A house without Sakina would not be worth living in! She always had a sweet and cheerful smile and a very friendly nature. Other children sought her company as much as the grown ups did. She was very generous and always shared whatever she had with others. During the journey from Madina to Mecca and then Mecca to Karbala, Abbas was often seen riding up to the mehmil in which Sakina sat to make sure that she had everything she wanted. Sakina loved her uncle just as much. While in Madina she would, several times a day, visit the house in which Hazrat Abbas lived with his family and his mother, Ummul Baneen. Like any other four-five year old when Sakina went to bed at night she wanted to spend some time with her father. Imam Husayn would tell her stories of the prophets and of the battles fought by her grand-father Ali. She would rest her head on her father's chest and Husayn would not move from her until she fell asleep. When from the second of Muharram the armies of Yazid began to gather at Karbala, Husayn said to his sister Zainab, The time has come for you to get Sakina used to going to sleep without my being there!â€ Sakina would follow her father at night and Husayn had to gently take her to Zainab or Rubaab. At Karbala when from the seventh Muharram water became scarce Sakina shared whatever little water she had with other children. When soon there was no water at all, the thirsty children would look at Sakina hopefully, and because she could not help them she would have tears in her eyes. Sakina's lips were parched with thirst. On the Ashura day, she gave her Mashk to Hazrat Abbas. He went to get water for her. The children gathered round Sakina with their little cups, knowing that as soon as Hazrat Abbas brought any water, Sakina would first make sure that they had some before taking any herself. When Sakina saw Imam Husayn bringing the blood drenched 'alam she knew that her uncle Abbas had been killed. From that day on Sakina never complained of thirst. From the time when Imam Husayn fell in the battle field, Sakina forgot to smile! Kufa saw her as a sombre little girl lost in thought. Quite often she would sit up at night. When asked if she wanted anything, she would say, just heard a baby cry? Is it Asghar? He must be calling out for me! Knowing that her weeping upset her mother, Sakina would cry silently and quickly wipe away her tears! In the prison in Shaam she would stare at the flock of birds flying to their nests at sunset and innocently ask Bibi Zainab, â€œWill Sakina be going home like those birds flying to their homes? Then one dreadful night Sakina went to bed on the cold floor of the prison. For a long time she stared into the darkness! The time for the morning prayers came. Sakina was still lying with her eyes wide open. Her mother called out: Wake up, Sakina! Wake up, it is time for prayers, my child! There was only the painful silence! Our fourth Imam walked up to where Sakina lay. He put his hand on her forehead. It was cold! He put his hand near the mouth and the nose. Sakina had stopped breathing. In between sobs Imam Zain ul 'Abideen said: inna lil-Lahi wa inna ilay-hi rajioon. How was Sakina buried? Zainab held the still child as Imam Zain ul 'Abideen dug a grave in the cell. As the grave was being filled up after the burial the mother let out a scream! How could anyone console Bibi Rubaab? What could they say? They huddled around her, and the prison walls began to shake with the cry: Ya Sakina, ya madhloomah! !Bibi Rubaab put her cheek on Sakina's grave and cried out: â€œSpeak to me, Sakina! Only a word, my child! Speak to me! !